We know that happiness is found in small things. The Danish have clearly understood this. In Europe, they are considered to be the happiest people on the continent. Their secret? Hygge philosophy! Pronounced « hoo-ga », Hygge is an Art of Living Developed in Denmark at the end of the nineteenth century. At that time, the Danish population made a significant change; The inhabitants of this country began focusing on their families and social activities and put aside more common and costly outings. Today, the Danish are known to be arrogant, despite the fact that their weather is so gloomy. The Principle of Hygge Simple: you must simply create happiness in your everyday life. Here are some suggestions for applying it to your home. Hygge is not a principle that values luxury, it is quite the opposite. On the other hand, happiness is where it’s good to be! Depending on the season, it is possible to create a beautiful home environment without spending a fortune. 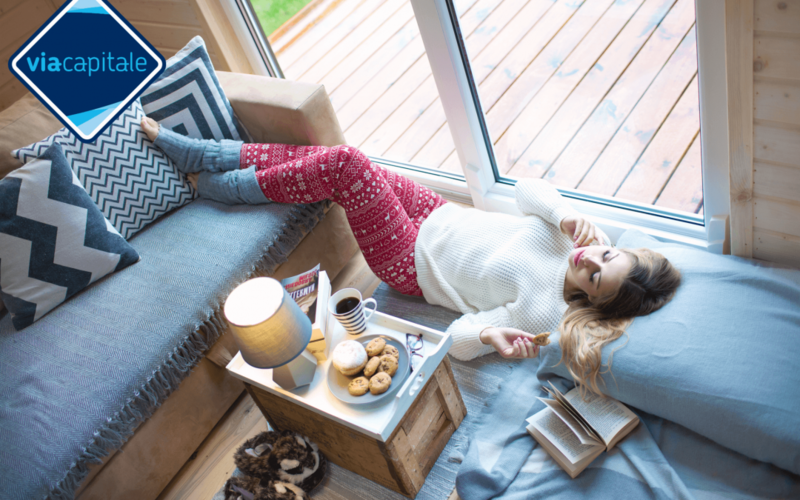 In the winter, it is enough to add cozy items such as a throw, cushions, a long-haired rug or a wicker basket filled with slippers next to the front door. Light a few candles, prepare hot chocolate with your family members and enjoy it while playing a board game. In the summer, let in the spring by swapping woolens with light materials such as cotton or flax, decorate the rooms of your home with green plants and freshly-cut flowers and above all, open the curtains! Tip: Think cottage! The Danish are the world’s largest candle consumers. It is also rare for a house in this country to have no fireplace. The reason is simple: they love creating moods with light. A quiet atmosphere would be favorable to confidences, authenticity and open-mindedness. It is not uncommon for Hygge fans to enjoy candle-lit diners. And for them, this is not necessarily a romantic moment! Référence : https://fr.depositphotos.com/ Do you want to learn more about this philosophy that makes its fans happy? Hygge : Danish well-being by Louisa Thomsen Brits or The Book of Hygge by Meik Wiking are books that can help guide you through this journey. Enjoy the discovery and above all, take good care of yourself!